Electro-metal act The Defiled are making quite a wave on an international scale at the moment, having just finished on tour with The Deathstars, the London-based five-piece are about to unleash their new EP ‘1888’ upon us before touring Europe with Static-X. We thought that this would be a great time to grab a few words with the band’s vocalist Stitch D about new plans for the coming months, the importance of Industrial music and of course, we talk about gigging up North. The track that is the video’s inspiration is also the centre-piece for their debut recording ‘1888’ which will be released in the next few weeks. Stitch explains that the concept for the EP and ‘The Resurrectionists’ is based around their passion for London and its spirit. The EP was recorded in Europe at Metropolis Studios with former Machine Head and Slipknot producer Rohan Onraet. Stitch describes how the band worked alongside him throughout the recording process to achieve the best result possible. 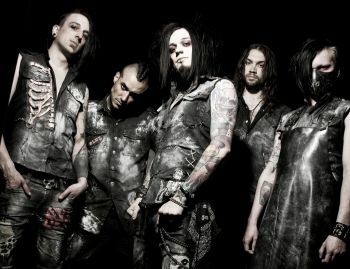 The Defiled will not rest until after they are smashing up stages for hours at a time, and the singer assures us that they have already begun working on a debut album that moves away from the themes and ideas explored on ‘1888’.“The album should see the light of day next year depending on fans’ reaction to the EP,” says Stitch. Besides the lyrics the band’s cataclysmic sound crosses between the genres of metalcore and Industrial, and Stitch tells us that fusing electronic music with heavier music was always something that the group had intended to do. *Many thanks to the band and to Adam Sagir for setting this up.